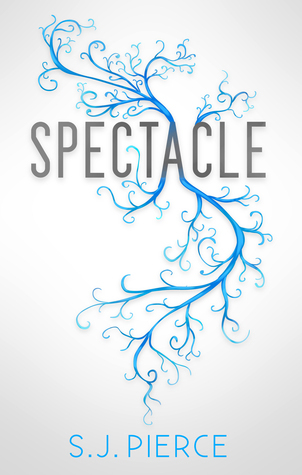 The book tour for Spectacle by S.J Pierce stops here today! (Through Xpresso Book Tours) I have a excerpt and general information all ready to go! Heat crawls over my skin, flushing my cheeks and leaving gooseflesh on my arms. Dread squeezes my lungs. “Okay,” I manage, but it takes me a minute to remember how to walk. Mom doesn’t move out of my way. I notice the radio isn’t on again. Dad usually listens to it for his morning news. She kneels to look me at me on my level, and I know now something really bad must have happened… or is happening. Yet again, the rings around the moon were right. My eyebrows draw together. Warn me? I hear dad shifting in his chair, and he grunts nervously. My chest clenches tighter. All I want is to see him. To know what’s going on. I can’t fathom what she would have to warn me about. “Yes, baby,” she soothes. “And whatever you do, please don’t scream. You know how thin these walls are.”I muster a nod. She leads me into the kitchen, my heart racing, eyes snapping right to my father. He’s sitting with his face behind his hands, his elbows resting against the tabletop. The skin on his arms and hands look the same to me – smooth and the color of coffee with milk. Still normal. I breathe a sigh of relief. “Is she looking?” he asks through his hands. He lets out a long slow breath – a brooding sigh. “Show her, Grant,” mom pleads. Moments pass. He sighs again and slowly moves his hands away. Behind them, blue marks, starting at the corners of his eyes, branch out in a rough, jagged pattern - like webs of blood vessels, but more defined - over his cheekbones and stopping along his jawline. Smaller patches curl around his temples. It almost looks like a butterfly, almost beautiful, like these odd markings are meant to be there. Like someone had painted them for fun. I would assume this is all a joke had my mom not been acting so weird. I look up to her questioningly. Why would this have made me scream? Her hand meets her chest, and I can tell she’s relieved I didn’t freak out, but not all the concern is gone from her eyes. At least she’s smiling normally now. “So you aren’t afraid?” she asks. Her lips press tight. She throws a nervous glance at my father.